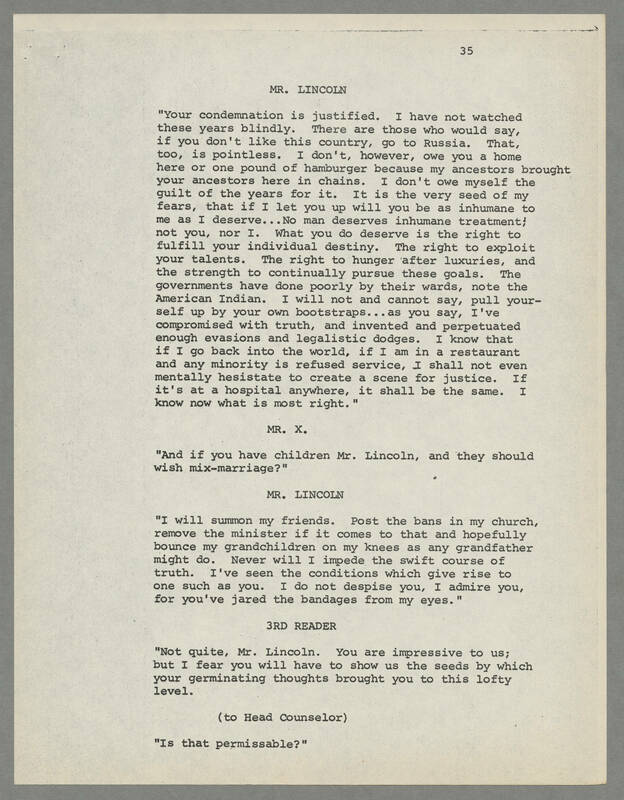 35 MR. LINCOLN "Your condemnation is justified. I have not watched these years blindly. There are those who would say, if you don't like this country, go to Russia. That, too, is pointless. I don't, however, owe you a home here or one pound of hamburger because my ancestors brought your ancestors here in chains. I don't owe myself the guilt of the years for it. It is the very seed of my fears, that if I let you up will you be as inhumane to me as I deserve...No man deserves inhumane treatment! not you, nor I. What you do deserve is the right to fulfill your individual destiny. The right to exploit your talents. The right to hunger after luxuries, and the strength to continually pursue these goals. The governments have done poorly by their wards, note the American Indian. I will not and cannot say, pull yourself up by your own bootstraps...as you say, I've compromised with truth, and invented and perpetuated enough evasions and legalistic dodges. I know that if I go back into the world, if I am in a restaurant and any minority is refused service, I shall not even mentally hesitate to create a scene for justice. If it's at a hospital anywhere, it shall be the same. I know now what is most right." MR. X. "And if you have children Mr. Lincoln, and they should wish mix-marriage?" MR. LINCOLN "I will summon my friends. Post the bans in my church, remove the minister if it comes to that and hopefully bounce my grandchildren on my knees as any grandfather might do. Never will I impede the swift course of truth. I've seen the conditions which give rise to one such as you. I do not despise you, I admire you, for you've jared the bandages from my eyes." 3RD READER "Not quite, Mr. Lincoln. You are impressive to us; but I fear you will have to show us the seeds by which your germinating thoughts brought you to this lofty level. (to head counselor) "Is that permissable?"